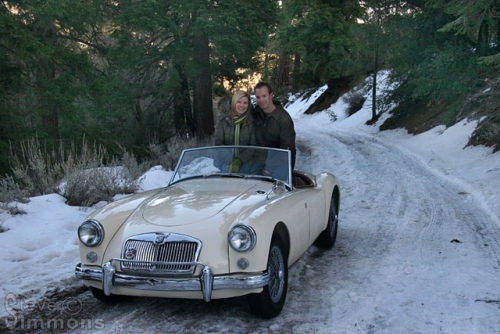 When we bought this 1958 MGA Roadster, it was first new addition to our stable in many years. I had always fancied owning one of these cars, but at the time I never really expected it to happen. We bought it practically sight-unseen from 3,000 miles away. A few weeks before buying this car, I showed Linda a photo of an MGA for sale. She was in love, literally gasping when she saw it. Seizing the opportunity, I said we could buy “her” one. It worked! Soon after, we found this gem across the country. Based on pictures taken by a “non-car” friend we took our chances on what looked like a very nice MGA. It was completely restored by a retired US Air Force aircraft engineer, then bought by a friend of his. With only 700 miles on the restoration and a wife nagging for garage space, he sold it to us for a great price. When the carrier pulled up we were nervous but soon calmed by the sight of the car in person. It had been fully restored and looked the part, with no hidden surprises. Since then we have done further restoration work to bring it to an even higher level. We enjoy everything from Sunday drives to weekend trips in this car. It has such a wonderful blend of performance and vintage feel. Plus, you just can’t beat the looks of an MGA! Finding the MGA, previous owner history and photos of the restoration process. A collection of photos of the MGA including details, road trips, etc. Photos of various film and photography projects this MGA has been involved with.